The last year has turned out to be a fantastic time for filling out the early history of Japanese animation. Between the release of Digital Meme’s four-DVD boxed set of silent anime and the Japan Society and Cinémathèque Québecoise‘s recent retrospectives as well as forthcoming books, major knowledge gaps are finally being filled and it’s a joy to behold. The latest find is a pair of two-minute films from 1917 and 1918, Namakura Katana (An Obtuse Sword), and Urashima Taro. 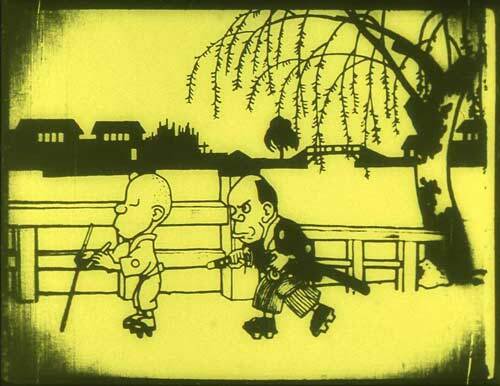 Namakura Katana is considered the second animated film ever made in Japan. What’s particularly miraculous is that when the films were bought last year at an antique fair, they were in nearly perfect condition—a feat under any circumstances, but more so when you consider how much early film was lost in Japan during the Kanto earthquake in 1923 and the firebombings of World War II. According to the Mainichi Daily News, you’ll be able to see Namakura Katana for yourself—if you find yourself in Tokyo. Starting April 24, it’ll be shown at the National Film Center.